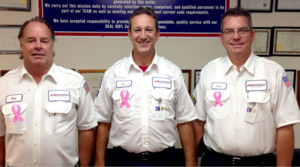 WEST PARK, FL, October 06, 2018 — A to Z Statewide Plumbing is proud to announce that it has teamed up with the Florida Breast Cancer Foundation to help end breast cancer. “Cancer is something that affects almost all of us in one way or another. A to Z Statewide Plumbing is dedicated to supporting this great cause so we teamed up with FBCF again this year because of their South Florida roots and advocacy and purpose,” said Aaron Atkins.